Casino International | The numbers of the nine COTAI resorts. Doing the numbers! Casino International > Latest News > Asian News > The numbers of the nine COTAI resorts. Doing the numbers! MGM COTAI is not only the smallest of the existing integrated resorts in Macau, it was also one of the most time-consuming to build. Very different from Venetian Macao which was the fastest and biggest! When SJM opens the doors of its Lisbon Palace, COTAI will have nine integrated casinos and resorts (IR). Given the lack of space on the site and the repeated unwillingness of Macau policymakers to build casinos on the new landfills, these nine gaming and tourism complexes will be a very representative sample of what we can expect from gambling in Macau in the future. These nine IRs have very different histories, varied contexts and innumerable constraints (one of them the lack of information) that make any comparison difficult. Even so, the-near 72,000 square metres of MGM COTAI make it the smallest of the nine, the only one boasting less than 100,000 square metres of construction. City of Dreams (115,000 sq.m) and Studio City (130,000 sq.m) are the closest. The big difference lies is in the construction deadline. Melco took three years to open its two properties on COTAI (although work on Studio City began in 2007 it barely progressed beyond its foundations, resuming in 2012), while MGM necessitated 4.5 years. Yet, in absolute terms the latest of Macau’s gaming and tourism complexes is not the most time consuming. Sands COTAI Central was started in 2006 and only opened in April 2012 – around 6 years, therefore. ‘Work started in 2006 but the project went through a period of suspension due to the global economic crisis. During this period, work on the project came to a complete stop and it was therefore quite a challenge to restart the project,’ according to the main contractor, Hsin Chong. About six years is also what it took to build Phase 1 of the Galaxy. In this case, we must take into account that we are talking about one of the largest construction areas of COTAI (550,000 sq.m) although the company recognises that a project that should have taken three years – 2008 was the year it should have been ready – ended up taking twice as long. ‘Under the influence of the global financial turmoil, the Group made a strategic decision to slow the pace of development in COTAI with the aim of completing construction and opening the project as economic conditions improved. We wish to reconfirm that construction continues on COTAI, but at a slower pace,’ we can read in the company report for 2008. The following year Galaxy set the new date of ‘early 2011’, which was eventually confirmed. If SJM inaugurates its Lisboa Palace in February of next year as some analysts anticipate, while the company is still talking about opening in 2018, SJM’s first IR will have taken exactly five years to build (February 2014 – February 2019). This is followed by the four years it took to build Wynn Palace and The Parisian Macao. And then the fastest – the ones that took about three years. We have already mentioned two – Studio City and City of Dreams – but the grand prize goes to The Venetian Macao: only three years to build a massive 980,000 square metres. That is, the shortest term for the largest building area. If the construction deadlines for the various IRs of COTAI are very dependent upon the economic situation – internal and, above all, external – which led several concessionaires to postpone their inaugurations, even for the problems of financing their works, the final costs are more dependent upon the commencement of construction. There are obviously other factors to take into account such as the size of the project and the equipment placed but as you may realise pre or post-2010 made all the difference to the construction bottom line. Building in 2004, as did The Venetian Macao, City of Dreams and Galaxy, cost considerably less than doing so a decade later. It can be said with some margin of confidence that IRs built in the past 10 years, even the behemoths such as The Venetian Macao and Galaxy, came in at less than MOP20 billion, while almost all of those inaugurated during the course of this decade surpassed that barrier. Two exceptions: The Parisian Macao, finished in 2016, posted a revealed cost of precisely MOP20 billion, while Studio City (2015) posted MOP18.4 billion. Costs can vary significantly: Sands COTAI Central cost MOP32 billion, Wynn Palace cost MOP32.8 billion and Lisboa Palace MOP37 billion – the latter being far and away the most expensive. A final note that the IRs built in COTAI have generally exceeded estimates. Two examples: The Venetian Macao forecast MOP14 billion but cost some MOP4 billion more; MGM COTAI stood at MOP27 billion, six billion more than originally forecast. Macau’s gaming industry is paying top dollar to those running the casino firms but a recent study hints operators are being short-changed. And experts warn that the control held by these larger-than-life entrepreneurs does little to help improve companies’ corporate governance and transparency. 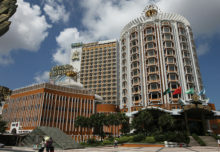 Macau casino operators pay their Chief Executive Officers (CEOs) some serious dough but according to a recent study they did not get maximum bang for their buck in 2016 as the gaming industry was only just exiting a two-year slump. Recently, Aethos Consulting Group released its 11th annual study on the pay of gaming CEOs, looking at 36 listed companies. This pay-for-performance model compares stock appreciation and earnings growth over a three-year period as well as a company’s size, says Aethos MD Keith Kefgen. “It’s much tougher to steer a huge company like LVS [Las Vegas Sands] and turn it around versus some small cap company which you can easily double the size of by doing one transaction,” he explained to Macau Business. Then Aethos compares the results with the CEO’s pay package, which includes base salary, bonuses and stock grants, and drafts an index of their performance, looking at the industry as a whole. “If the index is below 100, they were probably overpaid. If it’s above 100, they’re actually underpaid, even if they were indeed paid a lot of money,” says Kefgen. The index for 2016 makes for grim reading, with four of Macau’s gaming CEOs posting an index of below 66. The exception was the lowest paid on the list, Lui Che Woo, chairman of Galaxy Entertainment, who posted an index of 168.7 but took home only US$6.3 million (50.7 million patacas). A far cry from the US$28.1 million earned by Steve Wynn, the founder of Wynn Resorts, and the highest-paid gaming CEO in the world. Aethos created this model “because of the very issues that tend to crop up when talking about CEO pay,” says Kefgen; namely, that executives are paid mind-boggling figures, many times what an average worker in the same company is paid. The chairman of Melco Resorts, Lawrence Ho, for instance, took home the highest base salary in the industry worldwide in 2016 at a cool US$3.4 million. That’s almost 15 times higher than the median wage in Macau’s casinos of 231,600 patacas a year, according to official data. “It’s more important to understand if someone earns their pay rather than the simple size of the pay check,” says Kefgen, emphasising the impact gaming CEOs have on the city’s economy. Sheldon Adelson, for instance, “took some very big risks going into Macau and turned it into a business that didn’t exist before,” says the executive, recalling how the Sands China chairman was the first to envision Cotai as a new casino strip. Corporate governance watchdogs are not nearly so ready to praise Macau casino operators. Back in 2012, GMI Ratings gave Las Vegas Sands an F, its lowest grade, as it highlighted ‘ongoing concerns’ over Adelson’s compensation and transactions made with companies owned by the CEO. That same year, the agency gave Wynn Resorts a slightly better rating, a D, while criticising the millions of dollars in wages paid to the relatives of Steve Wynn’s ex-wife. But it is not just US firms which face such problems, Adrian Lei, a corporate governance researcher at the University of Macau (UMAC), says Sociedade de Jogos de Macau (SJM) is a major example of how a Chinese family business can go public but still maintain its culture. “A lot of the owners still think they can just take the cash directly out of the company’s bank account,” he told Macau Business. Even Lawrence Ho, son of SJM founder Stanley Ho, expressed his frustration during a conference call last May, criticising the operator’s billions of patacas in cash reserves. “I would suggest all institutional shareholders and analysts get the company to pay a bigger dividend and act like a normal company,” he told them. Adrian Lei says these issues are an inevitable by-product of having a CEO who is also a company’s major shareholder. “There’s one dominant decision-maker” who seeks to protect his or her interests, the researcher adds, often harming smaller shareholders. Another UMAC professor, Carlos Noronha, agrees that such a concentration “is not positive” because it removes the “healthy struggle and competition between different interests” brought by various executives, board members and shareholders. The Corporate Social Responsibility (CSR) expert says this explains a lack of transparency in casino operators’ dealings. Noronha admits there has been “a large increase” in disclosures due to “government pressure” in connection with the mid-term review of the casino concessions launched in 2015. But, he bemoans, many disclosures are “very superficial, just a kind of window dressing”. And not all gaming firms responded the same, says the CSR expert, with different operators “favouring different stakeholders”. For example, he adds, while MGM focused their disclosures mostly upon culture, Wynn was mainly geared towards compliance with the law. Perhaps not surprising, given that the company is still facing legal probes concerning the removal of Japanese businessman Kazuo Okada from the board and a 1.1-billion pataca donation to UMAC. But things are changing, says Kefgen, who is also the compensation consultant of record for Las Vegas Sands. He believes casino operators’ internal committees are spending more time deciding upon pay. “There’s a renewed sense of responsibility; they don’t want to be seen as just rubber-stamping things,” says the Aethos managing director. He admits the gaming industry “used to be a lot more Wild, Wild West” when it came to compensation but says “it’s a lot more buttoned up today than it probably ever was”. The executive singles out as “a good sign” that seven of the 36 companies included on the study paid no bonuses to their CEOs. That includes Iao Kun Group, the loss-making VIP promoter which left the gaming industry last year, and Entertainment Gaming Asia, an electronic gaming machine subsidiary that Lawrence Ho’s Melco took private last year.